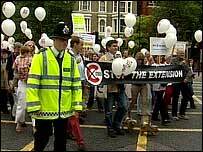 Hundreds of west London residents took to the streets to campaign against plans to expand congestion charging. Mayor Ken Livingstone wants to extend the £5 road toll westwards, which would cover areas of Kensington and Chelsea and more parts of Westminster. But residents claim it would damage their quality of life. The protest began on Saturday morning at The Cricket Field in Holland Park and ended at the bottom of Earls Court Road. This is the second march against the charge by Kensington and Chelsea residents. Hundreds turned out for the last one in April. The extended boundary would stop just short of Shepherd's Bush to the west, run as far north as Kensal Green Cemetery and down to Chelsea Embankment in the south, and it could be in place as early as 2006. One protester said: "We will not let this happen, we will fight this to the very end. "We do not need congestion charging here." Congestion charging was introduced in February 2003 for people driving throughout an eight-square-mile zone of central London. It has reduced traffic and journey times but some businesses claim in has damaged trade. About 3.3m households, 250,000 businesses and 1,400 other bodies have received a leaflet outlining TfL plans for the extension. The expansion would cover a much more residential area; about 230,000 residents compared to the 150,000 people living in the current zone. A TfL survey last year suggested over half of residents in Kensington and Chelsea wanted the charge. But this is disputed by the council, which says the plans split the borough, leaving 20,000 residents outside the zone. Where next for the congestion charge?